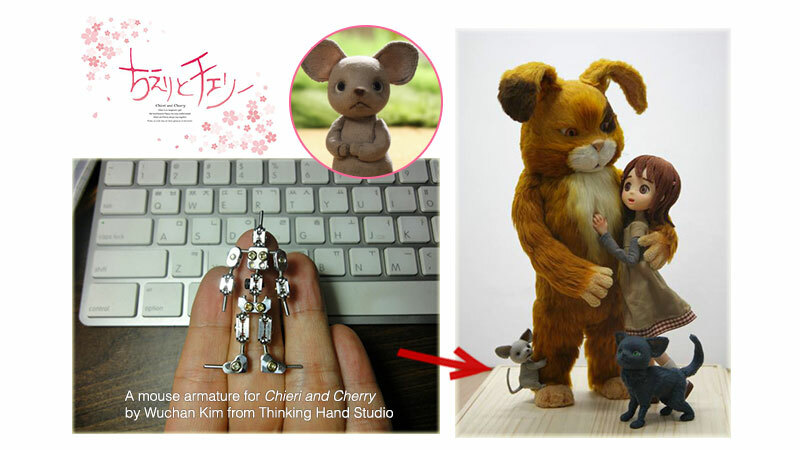 This is an armature for a mouse character in a newly released feature, Chieri and Cherry. For this Japanese animation, I’ve made various types of armatures including humanoids, four- and two-legged animals in different sizes from about 5cm to 50cm. It was quite time-consuming to make various types of armatures in a small quantity. Yet the most challenging part in this project was to make all the customized parts in so many different sizes. In order to make these customized parts and finalized armatures, I needed to spend a lot of time communicating with the puppet fabrication team and the animation team. This mouse character had to go through the same process. It was supposed to have a lot of movements, so the studio definitely wanted to have a ball-and-socket armature for it. Due to its tiny size, this armature became one of the most tested versions in the project. And it’s the smallest full-bodied armature in ball and socket I’ve ever made so far.